Social marketing. Content marketing. Real time marketing. Social customer support…app of the week/month (are we there?) and, of course, the all important and overarching: social business. You can read lots of posts across the Web (like a billion posts) about social marketing. Don’t get me wrong, I am not minimizing the value and role of social marketing or content marketing, and ultimately the emergence of social business. 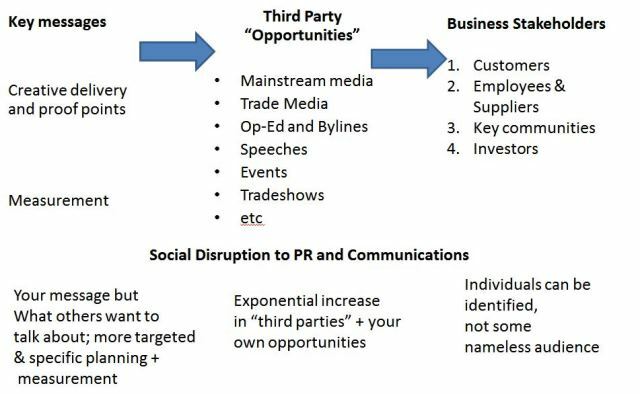 It is just I want to focus on communications/PR as a part of the larger opportunity given the disruptions to business as we know them. We don’t hear a lot about “social public relations” or “social corporate communications”. In fact, while social marketing generates billions of posts there are a mere half a million search results about social public relations. And, sometimes what is said is pretty challenging – it should be. Broadly speaking, the outline in the little diagram below (top section) is how we traditionally approached communications and public relations. At the bottom, I have outlined, in some general terms, the fundamental “changes” or disruptions we see as a result of social media — sort of a little framework for looking at how we PR pros might think different and step forward to begin to innovate. While communications and information sharing is at the very heart of the social web. So are the relationships and connections with the public. It is that connectivity that gives the public communications and information value. Building off the little diagram above, here are 8 thought starters for the Public Relations Professional and communications teams, as you think about about the social disruption to communications and why you should stop and rethink your strategy, not merely deploy new social tactics ( this is not a 12 step program, more on 12 step programs in another post, and then you will understand this :-)). PR is no longer reliant on third party media. Your strategy and tactics can focus on “going direct” to each of your businesses key stakeholder groups: employees/suppliers, customers, communities and investors. Traditional media we have depended upon is itself being disrupted. Your business thought leadership opportunities have been opened up so that you can imagine new — both the actual content and how you will “share” it in direct and new ways. Those “direct connections” and relations with your stakeholders are specific individuals and have “pr power” in their own right, as well as in new and more meaningful ways. Is that factored into your current PR strategy? If you thought cutting through the clutter was difficult before social media, you are now awash in world of information….I call it the avalanche of information. The challenge of how you cut through clutter is harder than ever. And the new filters (more to come on this) make that challenge even more interesting. It’s not all you and your company. That’s about control; its about crises, it’s about a lot of different ways you thought about communications and PR. It is not all “top down” or “push” anymore. It can be bottom up and somewhere in between. Pull. What are your PR strategies focused on “bottoms up” and “pull”? Your results are actually more meaningful and the impact you can have is more demonstrable. 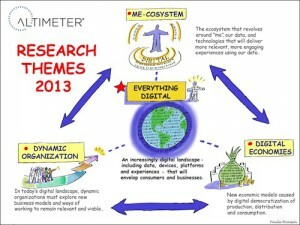 Have you thought about new ways to measure and prove your value? Based on the fundamental changes and disruptions, it is time to re-imagine what PR and communications can do in order to embark on its own journey to be a part of, or play a leadership role, in the evolving social business. We are going to have some great conversations about that at the PRSA Counselors Academy Conference and you can find a few other thoughts here. And, yes that leading role by PR folks has a historical precedent (noted above) , as well as from others, such as Arthur W. Page who wrote strong editorial articles about the responsibilities and duties of U.S. corporations to its consumers. Let’s not step away from that responsibility to help our businesses lead in this new environment. Have you strategically thought through your public relations strategy and tactics and explored new opportunities to both tell your story and more meaningfully connect with the people who care, or the people you want to care, about your business? What works and doesn’t? How is your corporate communications strategy and team taking advantage of the social web to do more for your business? Social business is not just social marketing…it is social across lots of parts of your business. PR is one of them. Are you experimenting and innovating and exploring…or are you just deploying social tools like Twitter and Facebook in some tactical “add-on” sort of way? If it’s the latter…think about it. Maybe even Stop! Re-envisage the opportunities for your business and communications. It is your opportunity, responsibility and your time to create and deliver new “social” corporate communications and public relations…while also delivering more value to your business. Love this piece. We have a slide in our deck that talks about all the various stakeholders around social – including CorpComm/PR. More enterprises need to be thinking about this!